It is a brand new year that is only days old, but that doesn’t seem to slow down the guys over at ORA. 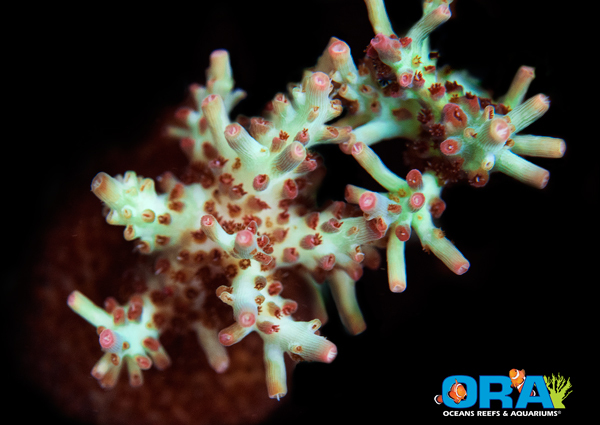 Along with the recent release of their beautiful Blue Hypnea macro algae just a few days ago ORA (which was technically still 2013), they are starting the year with a stunning release of a beautiful coral, the ORA Shortcake Acropora. Not to be confused with the famous Strawberry Shortcake, the ORA version unique in the fact that this piece was acquired from LiveAquaria back in 2009 as a wild Australian colony. This beautiful new coral has bright green with corallites that are a pink to red hue. It also has a dark red base with the polyps being of the same color…all very similar characteristics of the other shortcakes. In terms of care, ORA has given a few tips on this coral. They suggest to place this acro higher up in the aquarium, with middle to high intensity light and moderate to high flow. They have stated that this coral has grown in different environments for them and they believe it is a hardy specimen although a slow grower. Here is the link to the ORA website.